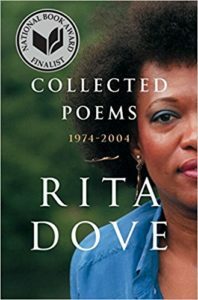 In reading Rita Dove’s National Book Award finalist, Collected Poems: 1974 – 2004, we bear witness to her maturation as both a woman and an award-winning poet. Dove opens this volume of seven books with a prologue, “In the Old Neighborhood,” set in her childhood home. The collected works are the ebb and flood of leavings, travel, and homecomings, hers and her personas’, and the lessons one learns over the course of lived experiences. of a girl gazing at the moon. I waited with her for her lover. He came in white breeches and sandals. your face, though I didn’t know it. each chamber steeled with a slim blue bullet. Furthermore, Part III of Yellow House focuses exclusively on slavery, often in persona form, in a manner that is as thought-provoking as it is haunting. For example, “Someone’s Blood” depicts a slave mother and a child of unspecified gender, a choice that conveys how the situation could apply to any slave mother and child. As this mother and child are permanently separated, the mother asks the child for forgiveness for giving him or her life, as chilling an image as possible and one likely to echo throughout the many mother-child interactions we see in daily life. In contrast, the next collection, Museum (1983), a more challenging read, is perhaps the most concerned with form experimentation, and in Dove’s increased risk and related excitement, readers cannot help but to be enthused as well. The poet begins to manipulate form in such poems as “The Hill Has Something to Say”; each stanza begins with a line that serves as a continuation of the title: “but isn’t talking.” The second stanza then starts “and takes its time.” This pattern continues for four additional stanzas, providing a powerful sense of the layering of time in a place. He hated Billy the parakeet, mean as half-baked sin. With a “museum” theme employed, this collection appears least concerned with contemporary socio-politics; simultaneously, it seems as though Dove is traveling, both literally across the globe, across time, and figuratively within, gaining perspective. Thomas and Beulah is a touching and insightful rendering of intimate family life through the lens of black history. While Dove’s volume contains considerable range, the fact that she is a black woman is always in our consciousness. Inversely, in, for example, “Nothing Down,” “A carload of white men / halloo past them on Route 231,” and whites or whiteness seem always to linger in the shadows of the African-American experience. To further illustrate, in “Taking in Wash,” Dove writes, “She was Papa’s girl, / black though she was,” though her father himself pales in the winter due to the “Cherokee in him.” Only the dark mother whose color “never changed” is there to protect the speaker from the possible predations of the light-skinned father upon his dark-skinned daughter, a reference to skin color as a persistent issue within the black community, beginning with the mainly forced integration of white genes into the population during slavery. The aunt is waiting for herself and her niece to be run out of the event and back to the “colored-only” beach “crisp with litter and broken glass”; however, the poem is set in Ft. Myers in 1962 and the niece, who narrates, does not believe the aunt about either her crab analogy or her assumption that they will be removed from the event. However, if it should happen, the persona determines, “…I’m ready.” Readers are energized by subtle changes as in her books Dove works from slavery through decades of slow progress toward the 2000’s. The eight-part “Persephone in Hell” is set in contemporary time, with references to such items as “good tennis shoes” and “honking / delivery vans.” Similarly, “The Bistro Styx” contains a modern setting. Perhaps most interestingly, “Exit,” written using second-person point of view, could be construed as either Persephone leaving Hell or any woman making a hard decision. Such effective hybridity proves fascinating and speaks to the issues of women across time. back where you came from, too. Dove asks readers to see the Civil Rights movement and ourselves in relation to activism through new eyes. Dove makes the interesting choice of not revealing the sisters’ fates until near the end of American Smooth, written nine years hence, in “The Sisters: Swansong,” a short, sad sequel, concluding in a powerful one-line stanza, “We all died of insignificance.” Both gender inequality and racial injustice create the texture of the world Dove illuminates. Dove plays strenuously with form again throughout American Smooth, such as when she writes “Rhumba” with the dancer’s thoughts and moves flush left alternating with the instructor’s dialogue in right flush, as if the words themselves are dancing—words that combine, then center for an embrace mid-practice. In American Smooth, Dove exhales and invites readers to do the same. By the end of this masterful collection, Dove has come full circle to the themes she highlights in her prologue. The final word that flows in in American Smooth is “home.” While reading, we travel as we remember the textures of home and contemplate the idea of “home.” In her poem, “Looking Up From the Page, I am Reminded of This Mortal Coil,” the poet asks, “What good is the brain without traveling shoes?” Just as with Dove, in the span of thirty years of writing, we, through reading, leave the volume more enlightened than when we entered. This collection brings a world of experience home to us. Janine Harrison teaches creative writing at Purdue University Northwest and is the 2017 Highland (IN) Poet Laureate. She wrote If We Were Birds (Moria, 2017). Her work has also appeared or is forthcoming in Veils, Halos, and Shackles: International Poetry on the Oppression and Empowerment of Women; A&U; Not Like the Rest of Us: An Anthology of Contemporary Indiana Writers; Broadsheet; and other publications. Former Indiana Poet Laureate George Kalamaras included Janine in his The Wabash Watershed "Six Indiana Women Poets" feature. She is a former leader of the Indiana Writers' Consortium.